Hot Link Pro WORKS WITH PLASMA TVs! Like all repeaters Hot Link Pro will “see” plasma and LCD TV Infrared spurious emissions. However when the Hot Link Pro IR Eye is mounted to the back of the set, it is shadowed from those signals and it can still “see” the remote signals. This method has been proven thousands of times over. Many installers that were trying to use “plasma-proof” or “friendly” IR targets have changed over to Hot Link’s Hidden Eye approach. Many of these targets are frequency specific and require two targets for the different frequencies. The only TV not overcome by this method is the Sharp Aquos 37 inch LCD TV (NTSC model). It will work other Aquos models in larger and smaller sizes. Plasma and LCD Compatibility of Hot Link Pro: Will Hot Link Pro work with Plasma and LCD monitors? Yes. Can Hot Link Pro be used to restore functionality of my remote controls that have been lost by interference caused by my Plasma or LCD monitor? Yes. Plasma and LCD monitors and TVs emit spurious Infrared (IR) pulses across a large spectrum of frequencies and at light wavelengths that are the same as those used for remote control transmissions. 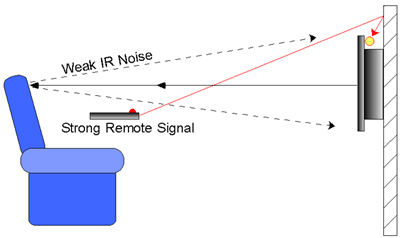 These monitor types interfere with a wide band IR remote control repeaters. Hot Link Pro has a sensitivity from 18 Khz to 120 Khz with the peak covering 38 to 60 Khz. The hypersensitivity of Hot Link Pro allows the eye to be shadowed from these monitors and still receive the intended signals from remote controls. The Blue LED will glow if receiving noise when the remote is not in use. By mounting the Hot Link Pro Eye next to or even behind the monitor, the spurious emissions are not seen by the Eye. However since the forward power of the remote control is greater than the emissions from these monitors reflected off of furniture, the IR Eye can still see and repeat the correct remote commands. Procedure for mitigating spurious IR noise from Plasma and LCD monitors: Mount Receiver Eye either next to or behind the monitor. With the monitor on, rotate the Eye away from the reflected energy in the room toward the wall the monitor is mounted to until the blue indicator LED turns completely off. Even if the Eye is facing the wall the monitor is mounted to it will still see the remote commands. Procedure to mitigate spurious IR emissions from exposed equipment: if the equipment is in the same room and has glass doors or no cabinet doors to block equipment from LCD or plasma emissions, use the following approach to mitigate spurious emissions. After mounting Hot Link Pro, place black tape over the Hot Link Pro Emitter and original receiving eye of AV gear to prevent spurious emissions from entering the equipment through the original equipment eye. *The Sharp Aquos LCD 37 inch (NTSC model) is extremely IR noisy. It will require hiding the eye almost completely or covering most of it with black tape and using a high powered remote like the URC-2 or Theater Master. If this does not work, it may require using an RF repeater and using Hot Link Pro as an IR distribution source within the cabinet.